Welcome to the February Chronicle! First, my kudos to the African American Heritage Committee on an excellent series of events for Black History Month! You can learn more here. This month’s Chronicle is a special Q & A communication, since I have received a number of questions lately that require your attention. There appears to be no optimal way to communicate with CSN students. How can we improve email communication with them? Thanks to all the CSN faculty and staff that helped make this January’s Connections events a success! In this transitory community in which snail mail is too expensive and ineffective, we have had no primary method of reliably contacting students. Emails sent to students’ preferred personal addresses, which they enter into MyCSN, often bounce back. Few students use their CSN student email accounts. Some students don’t use Canvas, and most students only check their MyCSN Communication Center a couple of times a year. The current set up has also led to certain providers, including Yahoo, Microsoft and Google, temporarily blocking CSN email addresses because they received so many of them and thought they were Spam. Not only is this situation aggravating cyber security, some aspects are illegal. From a technical perspective the matter can be quickly solved, but there are also policy considerations. In short, this cannot continue. Therefore, I’ve asked staff to create a mandatory student email policy that we will take to Faculty Senate for input. You’ll hear more about this in the near future. Please start encouraging students to use their student email addresses for all official communications. What is collective bargaining and why is it on the Board of Regents’ agenda? The Board of Regents Handbook provides for employee bargaining units within NSHE. As employee groups wish to pursue the collective bargaining process, that process is delineated in the Handbook, Title 4, Chapter 4. 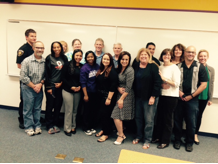 The Nevada Faculty Alliance (NFA) filed an application to represent academic faculty (instructing, counseling and library faculty) as a bargaining unit at CSN, and that application is on the March 3-4, 2016 Board agenda for consideration. If the Board approves the application, an election will be held by the academic faculty to determine whether they desire NFA representation. I will refer you to the Board of Regents Handbook for complete details on the bargaining process. How was a search consultant selected for the VPAA position and why is it needed? Filling any executive position at a college or university is a challenge as more incumbents retire and candidate pools are often limited. To cast as wide a net as possible, it is common for institutions and systems to retain search consultants to tap national networks to fill a position. During fall semester, CSN engaged an RFP process through the purchasing office to solicit proposals from interested executive search firms. A committee of faculty and staff reviewed the proposals and Executive Search of Washington DC was selected to work with CSN’s HR office on the search. An updated job description, position profile, and other documents were prepared for the search, seeking, again, the widest pool of candidates possible. A search committee has been established and will meet with the search consultant. A timetable has also been developed. At the request of the faculty, the minimum degree qualification was increased to a doctorate degree, and the institution will conduct a series of forums and interviews, pursuant to CSN policy and practice for vice presidential positions. I anticipate that college-wide interviews with finalists will take place the week of May 2. More information on the dates, times and locations will be announced for participation as they are available. Budget challenges will always be with us at CSN as a result of either institutional or statewide resources. Public pressure for efficiency and accountability and proving institutions can do more with less, are common in every state. Community college enrollment is also down nationwide and this is hurting many of our peer institutions. We will know more after the mid-spring semester census, whereas our enrollments are still changing. I would like to compliment Vice President of Finance Mary Kaye Bailey for her strong budget projections, which may have protected us from sizeable cuts this semester, even though our enrollment is still down this spring over last by about 3 percent. I’ll end this section with the ominous advisement that it is never a bad idea to be prepared. What are CSN’s prospects for the next Legislature? Legislators at the Black & Brown Democratic Caucus Education Forum this month discussed K-12 and higher education policies at the Cheyenne campus. Perhaps like you, I’m hearing that 2017 will be higher education’s year at the Legislature. But we have no reason to anticipate additional money. A large tax increase for Nevada’s higher education system is not going to happen and the nation is poised for another recession. CSN has taken an aggressive position for the legislative session, and budget priorities of the Board of Regents will be determined over the next few months. We know there are many competing priorities, including funding for the medical school and residencies, public financing for a stadium, changes and increases to the funding formula and increased funding for the Silver State Opportunity Grant. CSN’s initiatives outlined in previous chronicles will receive consideration by the Board of Regents in the March and June meetings for possible inclusion in the system’s legislative priorities. What’s been done with recommendations from the Work Climate Committee and its surveys? I was joined by Vice President Hyla Winters in a meeting with the Internal Recognitions Committee where each of the recommendations for that committee and program were discussed one-by-one. The Committee has adopted many of the recommendations and will be implementing them in the next recognitions cycle. Should you wish more information on the committee’s actions, please contact Michelle Fogg or Diana Woodhouse. I met with Maria Marinch, Executive Director of Community Relations, Diversity and Multicultural Affairs on each of the diversity recommendations to affirm their implementation. I met with Senior Vice President Patty Charlton on the safety recommendations for their implementation. On February 19, the report and recommendations will be discussed at the Extended Team meeting for all CSN directors and above. As a follow up to action steps and implementation, I and other members of the executive staff will be meeting later this spring with the Work Climate Committee. I would like to emphasize that I appreciate those of you who participated in the fall 2016 PACE survey. As those results are considered by the Work Climate Committee and recommendations are developed, I’ll report on them to the entire college community. Does CSN have funding for merit pay? CSN has no further funding for merit pay or COLA, nor is it authorized to make allocations on the money it does not have. At the beginning of the fiscal year, as contracts were renewed, CSN implemented the full compensation package authorized by the Legislature, which includes a second salary increase of 2 percent that you will see take effect this summer in the 2017 fiscal year. What’s being done to turn around enrollment declines? This month, CSN President Michael Richards and Sr. Vice President Patty Charlton visited with Rancho High School officials and Sandy Miller to discuss increased partnerships. CSN’s enrollment management has the institution’s undivided attention. All of us have a responsibility to invite students to enroll, help connect interested potential students to the institution and ensure they feel welcome at CSN. In addition, the Strategic Enrollment Planning Committee has expanded and redoubled its efforts. We are implementing a new student relationship management system, described below, which will help us better connect with students from recruitment through graduation. Members of the executive team and I are also visiting high schools, career and technical academies and working with school district officials to expand partnerships and strengthen the pipeline from our school districts to CSN. I saw an article in the Review-Journal about Silver State Opportunity Grant recipients. What do you think about the grant program and its 15-credit-per-semester requirement? There was an article in the RJ on Monday that indicated about half of CSN’s Silver State Opportunity Grant (SSOG) recipients failed to meet eligibility requirements after the first semester. This is a larger percentage than any other institution. The majority of our students lost eligibility because they finished with 12 to 14.99 credits and shy of the 15-credit requirement. The Silver State Opportunity Grant is a transformational scholarship in Nevada. This need-based grant is dedicated to community college and Nevada State College students in Nevada and we are advocating that increasing this fund and expanding this program be a Board of Regents’ legislative priority going forward. That said, with any public policy, an evaluation of the data is needed to see how we can improve this program, either on our end and/or at the state level. I’ve asked a working group to survey and conduct focus groups with our SSOG students to determine how we might improve our students’ chances of success. I should add that it is our students at CSN, who seem to be struggling the most with maintaining eligibility. Although we clearly serve students with unique needs in the system, I think the onus is on us to ensure they are prepared for the rigor of 15 credits and have the help they need to succeed. What is the transition plan for the people retiring? Each year as CSN employees retire or make other career choices, there are vacancies to fill and new folks to welcome to CSN. We will continue that process as smoothly as possible. We have a number of management positions to fill this year, including the Vice President of Academic Affairs. For most of these positions, we’re on schedule for interim or permanent appointments. In academic areas, I keep the leadership of the Faculty Senate informed of the status of searches and include faculty on as many committees as appropriate. What’s the role of the regents and the new institutional advisory council? The Nevada Board of Regents is the overall governing body for the Nevada System of Higher Education. Institutional Advisory Councils, whose members are appointed by the Chair of the Board of Regents, operate only for each of the four community colleges in the state as advisors to the institutional presidents and the regents’ Committee on Community Colleges. Here is the charge as approved by the Board of Regents in December. What’s the latest with NSHE’s interest in distance education? Many of you will recall the controversial Katz report, completed in 2013. As a result of that study, 26 distance education recommendations have been developed and submitted to the Chancellor. I anticipate that the Chancellor will discuss these further with the institutions later this year. How can we provide input into strategic planning? Because of CSN’s size and mission, large groups of internal and external constituents are rightly interested in participating in the strategic planning process. The Strategic Futures Task Force includes a core team of people, co-chaired by Professor Dr. Joshua Levin and Senior Vice President of Strategic Initiatives and Administrative Services Patty Charlton. This group is working diligently to gather data and collect insight from each of our valued employees and stakeholders to create the strategic plan, which will set the direction for this institution from 2017 to 2024. Ms. Charlton sent out an email earlier this week with more details about the process. We will have multiple listening sessions, an online and social media presence, and opportunities for all of our stakeholders to connect with the task force to ensure that the plan produced is thoughtful and representative. The Strategic Plan is a required part of our accreditation and a fundamental force shaping the decision-making process at this institution. At the same time, other functions of the college are developing plans that will be integrated into the strategic plan, areas such as diversity and IT. Should you wish to provide input to the planning process at any point in its progress, you may contact Dr. Levin or Ms. Charlton. The CSN Foundation and its exceptional trustees have labored the past year on a restructuring of the Foundation for comprehensive fundraising for CSN’s future. Additional staff will be added later this year. Concurrently, the Foundation has been providing funding to CSN’s Financial Aid staff for distribution of general and designated scholarships to students, while enhancing the infrastructure to support donations and the stewardship required for donors. We appreciate the work of the trustees and staff to position the CSN Foundation for comprehensive operations, for the cultivation and support of donors, and for the margin of difference private funds provide to CSN. What is a CRM and why is it needed? A Customer Resource Management (CRM) system is a tool for student recruitment, enrollment, admission and progress as students enter CSN and proceed to completion. CSN has acquired a CRM and will be implementing it over the next 18-24 months. The vendor selected was Hobson’s Radius system. You’ll be hearing more about it as the implementation proceeds. More and more higher education institutions are adopting this kind of a system to help with enrollment management, communication, and holistic support to students throughout their experience with the CSN. I fully expect that the features of this system will provide us with new data to create better decisions regarding student success. I also expect it will help improve communication with students and student case management. The end result is that it is expected to improve the overall student experience and I hope you will embrace this new technology whole heartedly. Is the new communication structure and strategy working? You may recall that I created an Executive Team of about 18 people and an Extended Team of about 90 folks to assist with institutional communication. These teams were created to supplement my monthly Chronicles of news and information as well as other avenues of college-wide communication. My commitment was to try this for a year and then assess its effectiveness as gauged through faculty and staff feedback. I have held monthly meetings of the Executive Team and two meetings, so far, with the Extended Team. The next meeting of the Extended Team is February 19. Early feedback is that this structure/strategy may not be as effective as initially conceived. Some revision, such as frequency of meetings with senior and middle management—meaningful meetings, I should add—may be in order. I’m also re-introducing campus roundtables for faculty and staff. As I walk the campuses and visit with faculty and staff, several have asked for more face time. These will take place at the following dates and campuses. A flier will be circulating shortly. Please R.S.V.P. to CSN Public Affairs Executive Director K.C. Brekken at kc.brekken@csn.edu. This entry was posted in Budget News, Monthly Chronicles and tagged budget cuts, chronicle, collective bargaining, CSN Foundation, CSN President Michael Richards, distance education, enrollment, IAC, merit pay, michael richards, nevada faculty alliance, Nevada Legislature, SSOG, strategic planning, work climate committee. Bookmark the permalink.